Filling half your plate with fruits and vegetables can be the most delicious thing you do every day - especially with these 11 Veggies Side Dish Ideas for the Holidays (or any day, really!). This content is sponsored by Half Your Plate. Fill half your plate with fruit and veggies at every meal or snack and you'll be well on your way to healthy eating every single day! The fall and winter holidays are quickly coming upon us. And if there's one thing all the festivities in the last part of the year have in common, it's food. And lots of it. The centrepiece might be a big, beautiful bird, a baked ham or roast but, I have a confession to make - my favourite part of Thanksgiving or Christmas dinner has always been the side dishes that show off veggies in all their glory. No steamed broccoli at those dinners - this is a chance for veggies to shine! So we've come up with 11 delicious veggie side dishes that will be a hit at any holiday dinner this year. And for even more tasty and inventive veggie side dish ideas, be sure to visit halfyourplate.ca regularly for recipe inspiration. 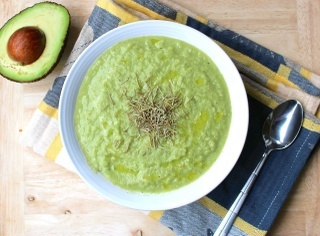 **[Cauliflower Kale Avocado Soup](https://phruitfuldish.wordpress.com/2015/11/05/cauliflower-kale-avocado-soup/)** is a great way to make a creamy soup that's great for vegetarian and vegan guests (and everyone else). From **Phruitful Dish**. **[Pumpkin Pickles](https://myediblejourney.com/2013/10/09/pumpkin-pickles/)** make for a great appetizer when paired with cheese or toss them into side salads. From **My Edible Journey**. Nobody can call these **[Hot Sauce Roasted Brussels Sprouts](http://merryabouttown.com/hot-sauce-roasted-brussel-sprouts/)** boring! These are guaranteed to turn Brussels sprouts haters into lovers! From **Merry About Town**. If spicy isn't your deal then try **[Brussels Sprouts Au Gratin](http://www.mykitchenlove.com/essential-thanksgiving-side-dishes/)**. Adding cheese to Brussels Sprouts can only be a good thing! From **My Kitchen Love**. Butternut squash is the quintessential autumn and winter vegetable. This paleo friendly **[Chili Garlic Butternut Squash](http://www.flavourandsavour.com/chili-garlic-butternut-squash/)** with an orange juice glaze is packed with flavour. From **Flavour & Savour**. Boost the already incredible flavour of roasted veggies with interesting seasoning choices - like these **[Roasted Fall Vegetables with Sage, Parmesan and Balsamic Reduction. ](http://chelseashealthykitchen.com/2014/12/03/roasted-fall-vegetables-sage-parmesan-balsamic-reduction/)** From **Chelsea's Healthy Kitchen**. **[Stuffed Sweet Peppers](http://jitterycook.com/2012/05/29/stuffed-sweet-pepper-hearty-and-healthy/)** are a great way to add a pop of colour to your holiday table! From **Jittery Cook**. **[Green Beans Almondine](http://killingthyme.net/2016/03/22/green-beans-almondine/)** is a really easy side dish that you can cook up really quickly! From **Killing Thyme**. This is a classic holiday side dish that always pleases a crowd - **[Roasted Whipped Sweet Potatoes](http://www.simplebites.net/roasted-whipped-sweet-potatoes-with-browned-butter/)** with browned butter. From **Simple Bites**. Entertaining vegetarians, vegans or people with severe food allergies this season? Check out our allergy friendly side dish recipes or how to feed vegetarian or vegan dinner guests! Tell us your favourite way to enjoy vegetables in your holiday side dishes in the comments. Feel free to share a recipe link with our readers if you have one!